Slovan Bratislava (Slovakia, KHL) recalled F Andrej Šťastný (Vancouver, 2010-11) from Dukla Trenčín (Slovakia, Extraliga). This season, with Slovan Bratislava, he had three goals and two assists in 29 games. In two games with Dukla Trenčín, he had one assist. . . .
Slovan Bratislava (Slovakia, KHL) recalled F Andrej Kudrna (Vancouver, Red Deer, 2008-11) from Banská Bystrica (Slovakia, Extraliga). This season, he had one assist in seven games with Slovan Bratislava and 12 goals and 15 assists with Banská Bystrica. THE LAST ON LEON . . .
Maybe it’s just me, but I’m thinking there are some terrible optics surrounding the trade that got German F Leon Draisaitl, 19, to the Kelowna Rockets. 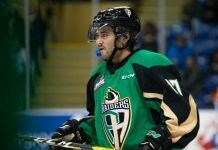 By now, you will be aware that Draisaitl, the third overall pick in the NHL’s 2014 draft, had been with the NHL’s Edmonton Oilers after spending the last two seasons with the WHL’s Prince Albert Raiders. At the moment, the Rockets are one of the WHL’s top two or three teams, while the Raiders are outside the playoff picture. As a result, when the Oilers finally decided to return Draisaitl to the WHL, they dictated that it wouldn’t be with the Raiders. In fact, they pretty much told Prince Albert GM Bruno Campese that they wanted Draisaitl in Kelowna. Campese, meanwhile, was putting a positive spin on all of this. 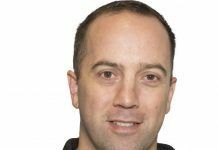 “To have been able to get into a position to acquire assets at this time for us, it’s almost a gift,” Campese told Jeff D’Andrea of panow.com. “People can look at it in any way they want but, up to several days ago, we had nothing for Leon Draisaitl. Today, we’re sitting here announcing that we got two, we feel, quality players, plus a couple of draft picks which include the first-round pick. D’Andrea’s piece is right here. Don’t forget, too, that Bruce Hamilton, who is the president and general manager of the Rockets, also is the chairman of the WHL’s board of governors. He also is on Hockey Canada’s management committee. He is, without a doubt, the most powerful man in the WHL today. At the same time, he is tight with a number of people in the Oilers’ front office, making you wonder if there was even one other team in the WHL that had a shot at landing Draisaitl. What if a team just outside the top four felt Draisaitl could push it over the top so offered up a couple of players and two first-round draft picks? Would that offer have been taken seriously? Or was this a one-way street with an NHL team operating as the traffic cop? And if that was the case, as it certainly appears to have been, was it all OK with the other 21 teams? Meanwhile, Elliotte Friedman of Sportsnet, in his weekly 30 Thoughts piece, writes that a European team actually inquired about acquiring Draisaitl’s services. Friedman’s latest 30 Thoughts piece is right here. The Lethbridge Hurricanes have claimed Austrian F Florian Baltram off waivers from the Seattle Thunderbirds. 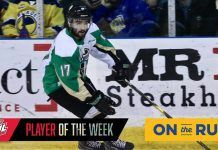 Baltram, 17, was released Monday by the Thunderbirds after Danish F Roberts Lipsbergs, 20, returned from the ECHL’s Stockton Thunder. . . . Baltram had a goal and four assists in 35 games with the Thunderbirds. . . . The Hurricanes also dropped F Dexter Bricker, 19, from their roster. 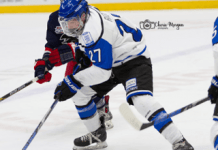 He is expected to join the SJHL’s Melfort Mustangs. Bricker, from Saskatoon, had three goals and an assist in 38 games. The Medicine Hat Tigers are having a tough time getting to Victoria, so tonight’s game against the Royals has been postponed until Thursday, 7 p.m. . . . It will be televised by Shaw-TV. . . . The Interior of B.C. was hit hard by snow from Sunday morning through early Tuesday morning. Kamloops, for example, experienced the largest single-event snowfall since 1927. As a result, a number of highways have been closed, mostly for avalanche control. . . . The Tigers arrived in Revelstoke on Tuesday at 1 a.m., only to find the highway ahead of them closed for avalanche control. In late afternoon, they decided to spend the night in Revelstoke. . . . Shortly after that decision was made, it was revealed that the highway may not open until at least noon today, which wouldn’t leave the Tigers nearly enough time to get over the Coquihalla Highway to the ferry. . . . Instead of playing three games in four nights in the B.C. Division, the Tigers now will play three-in-three as they are scheduled to meet the Giants in Vancouver on Friday and the Rockets in Kelowna on Saturday. . . . BTW, on Tuesday, there was a lot of freezing rain in the Interior. 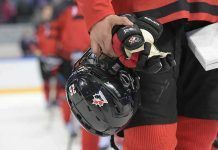 In lieu of the postponed game tonight, the Royals have invited fans to the Save-On-Foods Memorial Centre for a meet-and-greet with head coach Dave Lowry and D Joe Hicketts, both of whom were part of Canada’s victory at the WJC in Toronto on Monday night. . . . The rest of the Royals also will be on hand. . . . It all starts at Gate 1, 6 p.m., with a 90-minute free skate to start at 6:30 p.m.
With Tanner Faith’s season over thanks to a shoulder injury, the Kootenay Ice are in the market for a veteran defenceman, but general manager Jeff Chynoweth isn’t about to trade away any of his aces. . . . Taylor Rocca of the Cranbrook Daily Townsman has more right here. The Regina Pats named F Braden Christoffer, 20, as their new captain on Tuesday. 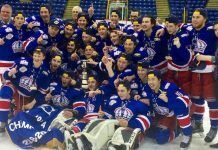 A new captain was needed after D Kyle Burroughs was dealt to the Medicine Hat Tigers on Monday. . . . Christoffer, from Sherwood Park, Alta., is in his third season with the Pats. . . . The Pats will go with F Patrick D’Amico, F Pavel Padakin and D Colby Williams as alternates. F Keegan Iverson of the Portland Winterhawks drew a two-game suspension for a match penalty he received on Sunday against the visiting Seattle Thunderbirds. Iverson had tape on a hand during a fight in which an opponent was injured. . . . He will sit out games tonight and Friday in Spokane. . . .
F Garrett Armour of the Saskatoon Blades got a two-game suspension for a boarding major and game misconduct he incurred for a hit on F Jantzen Leslie of the visiting Everett Silvertips on Saturday. . . . The Blades’ next two games are Friday in Lethbridge and Saturday in Cranbrook. In Brandon, the Everett Silvertips struck for three second-period goals and went on to beat the Wheat Kings, 5-0. . . . Everett G Austin Lotz, a native of St. Adolphe, Man., had family and friends on hand as he made his first career start in his home province a great one. He made 39 saves, including 21 in the first period. . . . He has three shutouts this season and nine in his career. . . . Everett was 3-for-7 on the PP, gettings its first two goals with the man advantage. . . . F Carson Stadnyk scored twice, giving him 15, while F Ivan Nikolishin had two assists. . . . F Remi Laurencelle added his eighth goal and an assist, while F Patrick Bajkov got his 13th goal and also had an assist. . . . D Reid Gow, who left the U of Manitoba Bisons to join the Wheat Kings, made his Brandon debut. . . . The Wheat Kings scratched F Rihards Bukarts with an undisclosed injury and D Ivan Provorov, who played for Russia at the WJC. . . . The Silvertips remain without D Kevin Davis, who has an undisclosed injury. . . . Everett (24-11-4) is 3-0-0 on a six-game East Division swing that continues tonight in Regina. . . . The Wheat Kings (29-8-4) had won five straight and had points in each of their previous 10 games (8-0-2). . . . 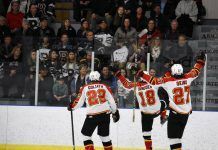 In Moose Jaw, the Calgary Hitmen scored three first-period goals and went on to a 6-1 victory over the Warriors. . . . F Connor Rankin scored his 19th goal, on a PP, at 3:07 of the first and F Carsen Twarynski got his third 1:14 later as the Hitmen got off to a hot start. . . . F Adam Tambellini upped the lead to 3-0, with his 23rd, at 16:29. . . . Tambellini finished with two goals and an assist, while F Chase Lang got his 17th goal and added an assist. . . . Calgary D Jake Bean, 16, had three assists. He’s got 18 points, all assists, in 29 games. . . . G Brendan Burke, acquired from Portland on Tuesday, hadn’t yet joined the Hitmen, so they had Thomas Spence of Moose Jaw backing up Mack Shields. It was the fourth time that Spence, 18, has served as an emergency backup in a WHL game. . . . D Reid Zalitach, 18, who left the Warriors for personal reasons early in November, has returned to the team. He was a scratch from this one and likely won’t play for a week as he works on his conditioning. . . . D Connor Clouston, acquired by the Warriors from the Kamloops Blazers earlier in the day, wasn’t in Moose Jaw in time to play. . . . Moose Jaw F Brayden Point, part of the golden Canadian team at the WJC, was to have played, but his equipment didn’t arrive in time. . . . Calgary F Jake Virtanen, who also played for Canada, wasn’t scheduled to play. . . . The Hitmen lost F Taylor Sanheim to a headshot major and game misconduct at 15:02 of the second period. . . . The Hitmen (22-15-3) have won two in a row. . . . The Warriors slipped to 16-21-4. . . . Matthew Gourlie of the Moose Jaw Times-Herald has a game story right here. . . . He also has a story right here on the Warriors’ Tuesday trades. In Prince George, the Cougars scored five times in the third period and beat the Tri-City Americans, 8-4. . . . The Americans took a 4-3 lead into the third period. . . . Cougars F Zach Pochiro tied it with his eighth goal at 2:57 of the third period and F Colby McAuley gave his guys the lead with his third of the season at 6:56. . . . F Brad Morrison had two goals, giving him 14, and two assists for the Cougars. He also was plus-5. . . . F Chase Witala, playing his 200th regular-season game with Prince George, got his 22nd goal. . . . Cougars F Jansens Harkins had three assists. . . . The Americans got two goals from F Beau McCue, giving him 16. . . . The Americans had D Mark Drohan in their lineup. A 16-year-old from Calgary, he plays for the AJHL’s Fort McMurray Oil Barons. He is expected to return to Fort McMurray after the Americans and Cougars play in Prince George again tonight. The Cougars (20-21-0) had lost their previous two games. . . . The Americans (18-19-2) have lost four in a row (0-3-1). 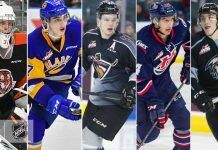 Previous articleTuesday’s WHL trade roundup . . .